Just about everyone I know has at least one cast iron skillet in their kitchen (or maybe in their camping equipment). Most of these pans were family hand-me-downs, but the more astute cook has actually searched them out at yard sales or thrift stores. Besides skillets–in all sizes–there are griddles, Dutch ovens, pots, waffle irons and muffin pans. In fact, cast iron was the world’s first “non-stick” cookware. Bare cast iron has been used in cooking for hundreds of years, as early as 206 A.D. in China. Cast iron was durable and was excellent at retaining heat, and that made cooking meals much easier. Before the 19th century, cast iron was used on an open fire or in a fireplace. Pots and pans were made with handles for hanging in a fireplace or legs for sitting in the coals or hot ashes. 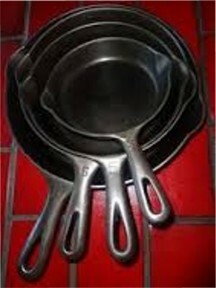 Flat bottom pans came into being after cook stove became popular in the late 19th century. From 1900 to about 1950, cast iron was the cookware to have in your kitchen. Cast iron (and other types of cookware like graniteware or enamelware) began to fall out of favor after the introduction of aluminum in the 1930s. Aluminum was lighter, touted greaseless-waterless cooking–a “modern” addition to the American kitchen–followed by easy to care for, Teflon®-coated, aluminum non-stick cookware in the 1960s. Today, cast iron cookware makes up a very small part of the cookware available to the modern cook. In fact there is only one major US cast iron manufacturer, Lodge. The goods new is that professional cooks still recommend cast iron pans as an essential tool in any kitchen. Cast iron pots and pans are made from one piece of iron so they can evenly distribute heat over the whole pan. Cast iron works on top of the stove and in the oven. The best cornbread in the world is made in a cast iron skillet (or a cast iron corn stick pan). Just heat the skillet in the oven while you are mixing up the cornbread batter (about 10 minutes at 250 F), lightly grease or spray with Pam®, add your batter and bake at 350 F. WARNING: remember the skillet handle will be HOT! Because cast iron can be used at high temperature, it is a natural choice for searing or frying. Because it retains heat, it is also great for soups and stews. Did you know that you can cook a turkey in a cast iron Dutch oven? A cautionary note here: You should avoid using acidic fruits like tomatoes or pineapple because the acid reacts with the cast iron and leaves an ugly taste. And then there is the “non-stick” surface of the perfectly seasoned skillet that makes it the best for eggs. Two well-known cast iron manufacturers from the late 19th century were Griswold and Wagner Ware. These pans are clearly marked on the bottom with distinctive logos. The earliest Griswold pans are marked “Erie” designating the company’s beginnings in Erie, Pennsylvania. 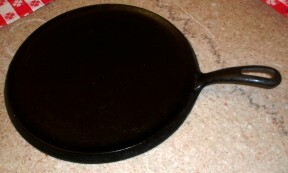 Griswold cast iron is highly collectible, but collectors avoid pieces with the small Griswold logo. Likewise pieces with the double stamped Wagner/Griswold or with Griswold Made in Sydney, Ohio are not considered collectible. Griswold closed its doors in 1957, and for a time Wagner used their molds before that company went out of business. Today the American Culinary Corporation owns the brands, but as I said earlier, Lodge is the only U.S. cast iron cookware manufacturer–everything else comes from Asia or Europe. Okay, you don’t have a cast iron skillet but after reading this article you want one. Don’t be afraid to check out the thrift stores–a dirty, rusty pan can be easily restored. Well, it does take a lot of elbow grease, but the result will be worth it. One important note here, when shopping for cast iron: STAY AWAY FROM ANYTHING MADE IN CHINA. You just won’t be happy with it. Is there a lot of icky, built-up grease and dirt on your pan? According to Jackie Clay in Backwoods Home Magazine, it’s “a lot easier to clean than you’d imagine.” Jackie builds a nice campfire–a fire in your barbecue would also work–toasts a few marshmallows and then shoves her pan into the hot coals, piling the coals over the pan with a stick. She says it only takes a little while in the fire to burn off all the build-up. “Suddenly it looks like new. Wow, almost magic!” Cool the pan and then wash it with hot, soapy water and steel wool (if necessary). Rinse with boiling water and dry. There are tiny pores in the cast iron, just like your skin, that absorb grease or oil. When this has been heated over time, it forms a natural, slick, stick-free surface. This “seasoning” is absolutely necessary for new and saved cast iron. You will also need to re-season any pans that have been washed with soapy water after use. 1. Wash, rinse and dry pan (new or reconditioned). 2. Rub shortening all over the inside of the pan. Wipe away any excess with a paper towel. 3. Place the pan in the oven at 200 F for several hours. 4. Remove the pan and inspect the surface. It should be darker and evenly coated with a slick finish. If not, repeat the process. Some cast iron enthusiasts say that you should never, never ever wash your cast iron cookware–just wipe it out after use. Washing your cast iron with soap will destroy the “seasoning” and you will soon have food sticking and/or burning. I mostly use the boiling water method. Pour boiling water into the pan and let it sit until you can put your hand in it. Then I use a nylon scrubby to clean the pan. The hot water softens the food, melts any grease and leaves the seasoning alone. Rinse the pan with boiling water and wipe it dry with a kitchen towel. Waffle irons or corn stick pans (and even skillets) can be dried upside down in a warm oven. If you don’t dry your pans thoroughly, your risk having them rust. Clean and dry your pans as soon as possible after using. Periodically you may need to clean off any built-up grease on the bottom or sides of your pan and re-season. Use the methods outlined above. My cast iron was handed down by my mother and grandmother, and from Jim’s family. We have a large skillet from Florence, Alabama that dates back to the 1860s. The Bulls Family brought it with them to Texas in the late 1870s, along with a 2-gallon cast iron kettle. 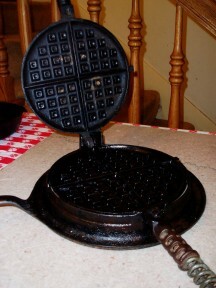 We have several Griswold skillets, a waffle iron and biscuit pan in our collection. I think you’ll like cooking with cast iron once you try it–all those cast iron aficionados who came before us couldn’t be wrong. In our house we use one of these pans nearly every day: an Erie (early Griswold) 11″ skillet, a Wagner 9″ skillet, two Wagner 6 1/2″ skillets (great for eggs) and a Griswold 11″ round griddle. In fact you could say, we’re cooking with history every day. Thank you. I am just collecting cast iron to replenish my kitchen after being gone for almost twenty years. I found a grill but had forgotten how to season it. I will do it today. Your article will go into my recipe book to remind me when I temporarily lose my thought. Great article. In addition, using cast-iron pans regularly casts off small amounts of iron into your blood, something many women are deficient in. Thanks so much for your comments. Maria, I’m so glad this could help you out. And Edith, good point! I totally forgot to add that fact to my article. We love our old cast iron. Some of our daily users are over 100 years old! !